Trump and not Tom Brady. Trump didn’t mention Brady during his remarks today, but he did mention a handful of other players who made key contributions to the team’s unlikely Super Bowl comeback. Among them was wide receiver Danny Amendola, whom Trump called out and asked to step forward. Turns out, like Brady, he wasn’t there either. Here’s the moment Trump looked for a Danny Amendola that wasn’t there. Amendola later tweeted that he was working out and preparing for a friend’s funeral. He thanked the president in the tweet, but deleted it after his followers revolted. Patriots owner Robert Kraft and head coach Bill Belichick spoke after Trump, with each of them heaping praise on the president. It was, Mark Murray of NBC noted, among the most “political” White House championship ceremonies in a long time. But Brady’s absence remains the most interesting story here, even if this isn’t the first time he’s skipped one of these events. In 2015, the quarterback missed the team’s ceremony with President Obama. Then, as now, he cited family issues. At the time, some speculated that Brady was angry at the White House for razzing him over Deflategate. Others thought that Brady, who’d attended three prior White House ceremonies with President Bush, was making more of a political statement. Whatever Brady was up to in 2015, few bought his stated reason for missing the visit. There are plenty of doubters this time around too, though his mother’s cancer is one obvious explanation for what his “personal family matters” might be. But let’s play cynic here for a second and assume that Brady is using “family matters” as cover to skip the White House. One possible explanation is that he’s protecting his brand. This is a guy who, outside of New England, is considered a cheater by a sizable chunk of the NFL fanbase. His relationship with Trump has already resulted in more negative attention than a man of his blandness cares for. Having new photos of him and Trump together would do little to win back the affection of those he’s already alienated. And Brady, who doesn’t have that much time left in the league, doesn’t need to be alienating anyone right now. To paraphrase a possibly apocryphal Michael Jordan quote: Democrats buy Uggs too. Another possible explanation for what Brady meant by “family matters” popped up on his wife’s Twitter account as the team was touring the White House. Maybe Gisele asked him to stay home. Brady and Amendola weren’t the only notable player absent from the festivities Wednesday. 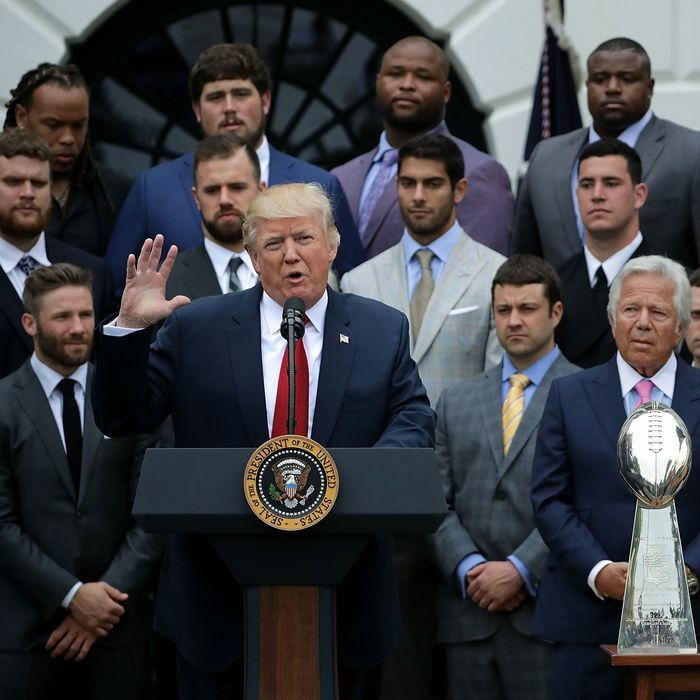 Days after the Pats won the Super Bowl, players with personal and political opposition to Trump began announcing their intentions to skip the White House. They included running back LeGarrette Blount, defensive end Chris Long, defensive tackle Alan Branch, linebacker Dont’a Hightower, tight end Martellus Bennett, and safety Devin McCourty. Hightower and Branch gave nonpolitical excuses for not attending, while Blount, Bennett, McCourty, and Long made no mystery about why they were sitting out. Blount said he didn’t “feel welcome” at the White House. Bennett, an outspoken supporter of Black Lives Matter, has previously criticized Kanye West for meeting with Trump, whom he’s compared to Voldemort. After the Super Bowl, McCourty told Time he wouldn’t attend because he doesn’t “feel accepted in the White House.” Earlier this week, McCourty and Chris Long appeared alongside Patriots fans in a video recounting the Super Bowl comeback and explaining their reasons for sitting out today’s ceremony. “When my son grows up and I believe the legacy of our president is going to be what it is, I don’t want him to say, ‘Hey Dad, why’d you go when you knew the right thing was to not go,’” Long says in the video. “I don’t believe in excluding other people,” McCourty adds.